Keio Plaza Hotel Tokyo, one of Japan’s most prestigious international hotels located in Shinjuku, Tokyo, will host an special exhibition of the Japanese traditional performing art called “Noh” from June 1 (Friday) to 27 (Wednesday), 2018. This exhibition is held in cooperation with The National Noh Theatre and is designed to help commemorate the 35th anniversary of its founding in September. As part of the exhibition, various art items related to “Noh”, including traditional carved wooden masks, intricately woven costumes and other artistic props, will be displayed in our Hotel lobby. Also, complimentary “Noh” performances will be held for approximately 20 minutes on June 7 (Thursday) and 21 (Thursday), 2018 in the lobby of our Hotel. Teruhisa Ohshima of the Kitaryu School of “Noh” will perform these complimentary performances and provide commentary on “Noh”. 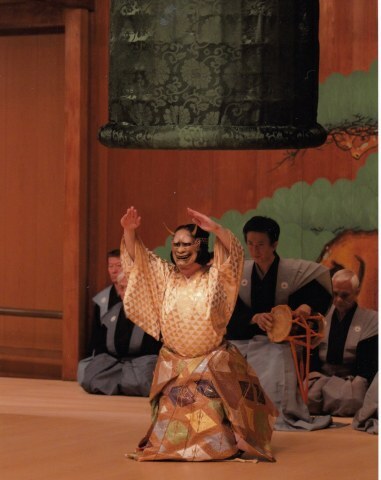 In addition, a live “Noh” performance of a play entitled “Aoi No Ue” based upon scenes from the classic Japanese novel called the “Tale of Genji” (Written during the 11th century) will be performed by Yoshimasa Kanze (A “Noh” performer belonging to the Yarai Noh Stage Group) on June 14 (Thursday), 2018. This “Noh” performance expresses the sorrow of a mistress over her jealousy towards Aoi No Ue, the wife of Hikaru Genji. In conjunction with this performance, specially prepared lunches will be served to guests at three of our restaurants. “Noh” has been performed for over 600 years since the “Muromachi Period” of Japan, and is one of the world’s oldest performing arts. The “Noh” acting and performance style have spanned national borders and cultures to influence performing arts of various genres globally, and was registered as an intangible cultural heritage by UNESCO in 2008 in recognition of its strong cultural importance globally. The Keio Plaza Hotel Tokyo is pleased to provide its guests from over 100 different countries, who now account for 75% of all guests, with the opportunity to enjoy “Noh” performing arts as part of our diverse range of “Cultural Experience Programs”.